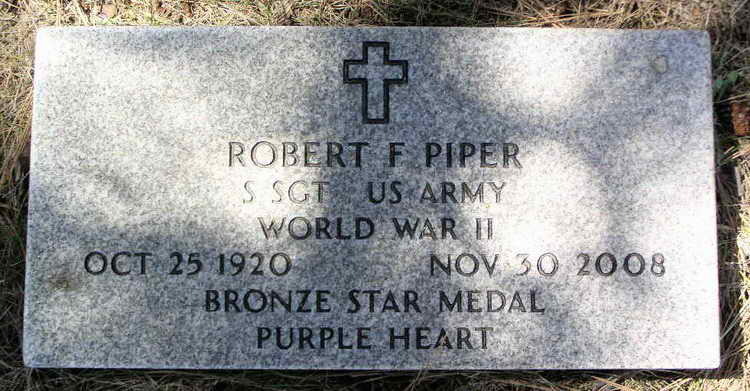 Grave marker for Robert F. Piper in the Citizens Cemetery, Flagstaff (Coconino county), Arizona. Robert enlisted in the Army at Phoenix, AZ on 7 July, 1942 and was assigned to Company G, 508th PIR as a Pfc. On 14 Oct 1944 Pfc Piper was promoted to Sergeant. On 6 November 944 Sgt Piper was listed as slightly wounded in Holland and evaluated. He returned to duty on 21 November 1844 but was transferred to Service Company for limited duty. Sgt Piper was again evacuated from the combat zone, in Belgium, on 25 December 1944 listed as a non-battle casualty, perhaps due to frostbite. He returned to duty on 12 February 1945.